Form letter for the passing of the Social Security Bill; This form letter was written for constituents who recommended that "Eldercare" be passed. 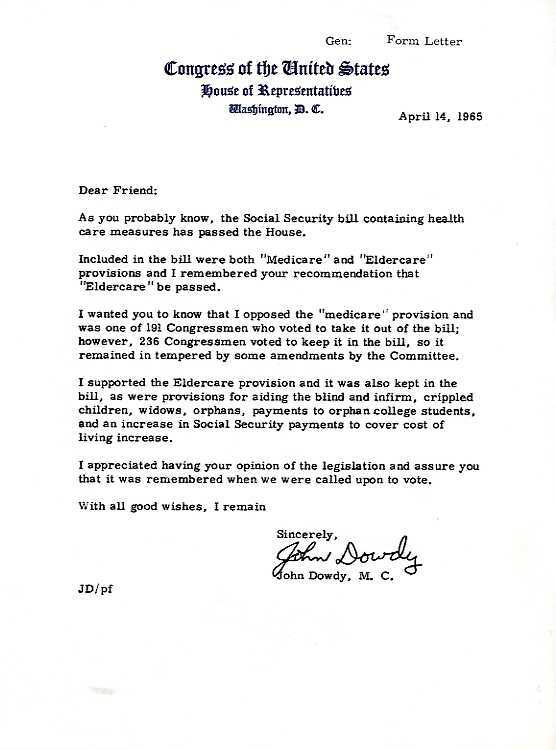 Dowdy informs the reader that he opposed the "medicare" provision, but supported the "Eldercare" provision. Dowdy, John. "Form Letter: Social Security Bill." John V. Dowdy, Sr. Papers, Box 409, File 352, "Form Letter: Social Security Bill," April 14, 1965, W. R. Poage Legislative Library, Baylor University, Waco, Texas.. Accessed 19 April 2019. http://acsc.lib.udel.edu/items/show/262. Social Security--United States. ; Medicare--1960-1970.; Health care--1960-1970.; Older people--Medical care--United States. ; Dowdy John Vernard, 1912-1995. John V. Dowdy, Sr. Papers, Box 409, File 352, "Form Letter: Social Security Bill," April 14, 1965, W. R. Poage Legislative Library, Baylor University, Waco, Texas.